Sue thanks Martin for climbing down into the 8 foot gorge where the 4 remaining kittens had been seen between the church & church hall in Auchtermuchty. He set the kitten trap & all 4 kittens were safely caught between Tuesday & Friday – they are now all doing well in a foster home. They were caught just in time as the mother cat is coming into season again – it is a scary time for a litter of kittens as un-neutered feral tom cats can be aggressive towards kittens that aren’t theirs! It is a relief that they have all been caught & the possibility of a new feral colony has been nipped in the bud. Thanks go to Hazel for her donation of gooseberries – Sue has made gooseberry & elderflower jam out of them. 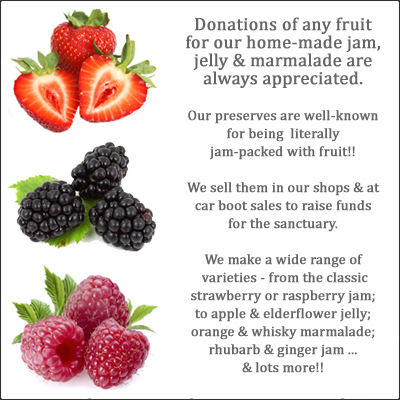 Any donations of fruit for jam-making are always welcome!